in a not-so-surprising move, Nikon announced today that it will be releasing the the successor to the D600, the D610, later this month retailing for a MSRP of $2,000. 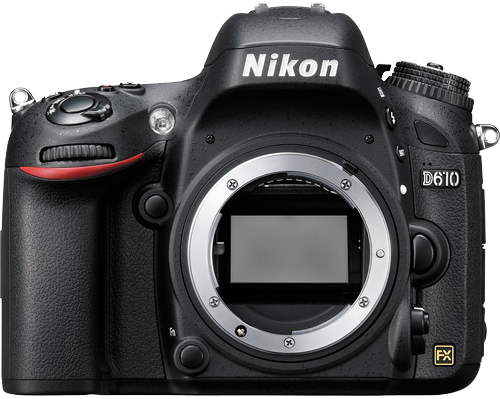 It's a 24.3MP FX sensor with the same Expeed 3 processor found in the D800 and D4. ISO expandable to 25,600, 39-point AF system with 9 cross types, continuous shooting at 6 FPS, 2 SD card slots, and 1080p video at 30fps. That's all well and good, but something seems awfully familiar about all this, but I can't seem to put my finger on it. Oh, it's because those are the exact same stats that the D600 has that was only released a year ago. So really, it's just a rebadged D600 then? Not exactly. This is really the Nikon "oh here, let me fix that for you" D600. With all the complaints over the oil spots on the D600, it was inevitable really that they'd replace it with a newer camera, seeing as how they already are replacing your camera for free if you do happen to get the dreaded oil spots on your D600. So that's all well and good, but is there anything else new? Apparently, they have a new, quieter continuous shooting mode that might be good for, let's say for example, you were shooting a wedding where you didn't want the minister to yell at you for being too loud. There's a new white balance setting that supposedly is more accurate, but really, that's kinda pointless if you're shooting raw anyway. So yea, what do you think about this whole situation? I don't think this is really going to sway that many people into upgrading, but then again, it wasn't really meant to. This camera is for those on the fence about getting a D600 due to the oil spot issue and to quell the vocal minority that has blown the issue out of proportion. So if you were thinking about getting that D600, you really have no reason to not get a D610 now, it's a fantastic camera and if you feel like saving a hundred bucks, there's always the almost identical D600 which may even drop in price more once this releases.